What will we do after our PhD?!? Well, probably we will be… brilliant but crazy (just kidding) scientists. At least that is what the statistics show. But we also have a good chance of exploring other options. According to Paula Stephan from Harvard, 48% of the proud PhD title holders stay in academia, 23% go to industry, 9% work for the government, 11% do something else (? ), and 10 % do not have a permanent job (Stephan, 2012). Ok. These are the American stats and we are in Germany here. I know, I know… So how is the situation in the land of beer and sausage? There is good news from a study conducted on 380 PhD graduates from University of Heidelberg, who finished less than 2 years from taking the survey. The good news is: 92% of the surveyed had a job. Sixty two per cent of them in research (Wow!) and 34% in industry (Sieverding and Evers, 2013). But the term “industry” to us is like the term “pasta” to an Italian. It can mean so many things! Will we be commercially growing hamburger meat on petri dishes? And will the vegetarians be ok with it then? Or will we be trying to find out how beneficial smoking can be? Will we be working more or less than in academia? (Sieverding and Evers claim 2,8 h/week less). Will it still be interesting? To answer all these (and more) questions we have decided to start a series of interviews about the out-of-university-carrier-paths. To make sure we cover at least the major possibilities, I have decided to look into statistics. 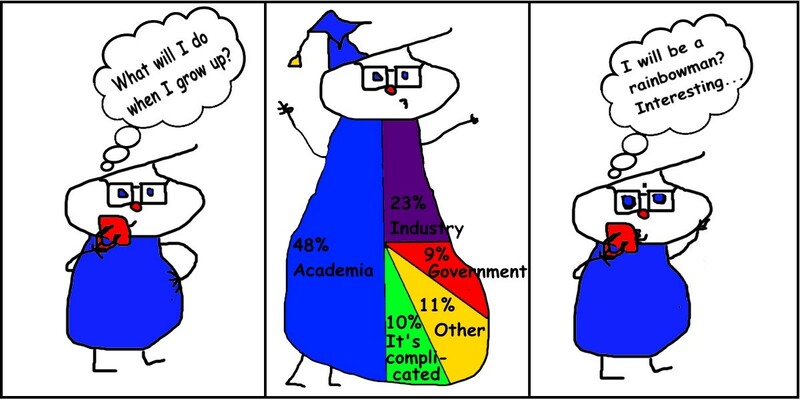 What is the most common position for scientists in industry? Well, there are some speculations, but the truth remains unknown to humanity (or at least to the Google engine). So… more studies need to be done, so to speak. But, hey, there is something like “Alternative carriers for PhDs”. So we will try to cover all these fields with a short intro and one or more interviews. If you’ve got something to add to this list, don’t be shy, let us know! Hope this series will be a step towards our future selves coming back from work, sitting on the couch, drinking an expensive alcohol and saying: heck, I like my job!